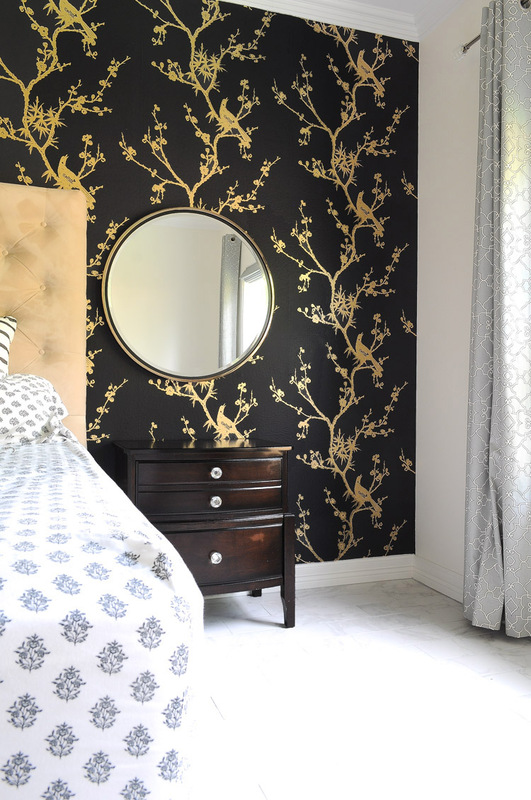 It is week two of the One Room Challenge hosted by Calling It Home, and I got what I think is the largest, most difficult part of our master bedroom makeover done…the wallpaper and mirrors! 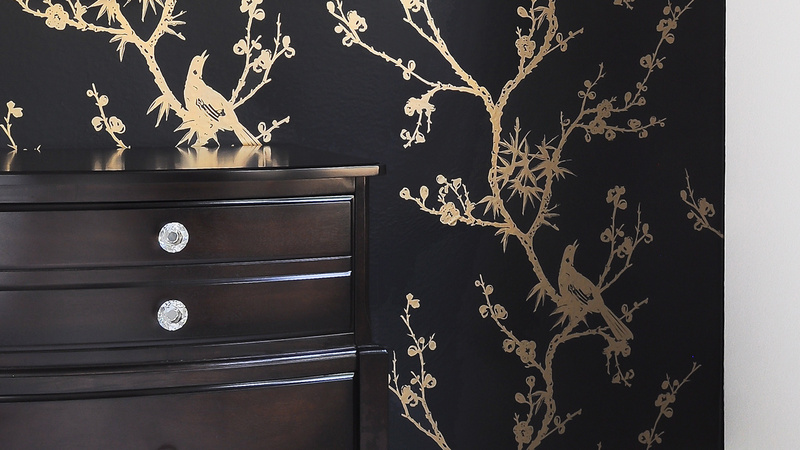 I chose Bird Watching wallpaper in the black and gold colorway from Cynthia Rowley’s collection for Tempaper. I loved the wallpaper online, but boy did I love it even more so in person. 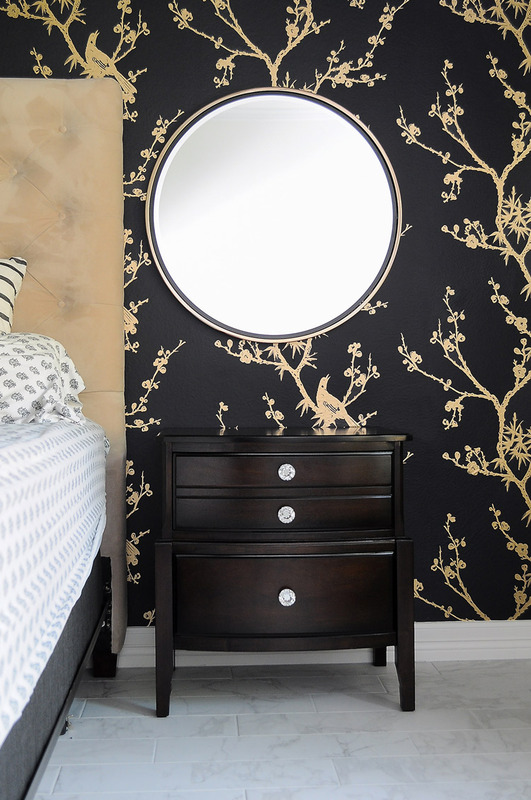 For the mirrors, it was love at first sight with the Wais mirror provided by Holly & Martin. Catch up on my Week 1 ORC post here. Background: We have 9′ ceilings (10′ in the tray area), so we ended up having to use four rolls, which were generously provided by Tempaper, for our master bedroom. Our wall is about 17′ feet wide, and the pattern match up is key to a polished look. I called two vinyl installers in my area and was less than enthused with their “10% margin of error” disclaimer, so this is the primary reason we DIY’d it. nuance, we stuck to general wallpaper principles. Supplies: The tools you’ll need are the wallpaper of your choice from Tempaper, a ladder, utility knife with a NEW blade, tape measure, smoothing tool, and a laser level. 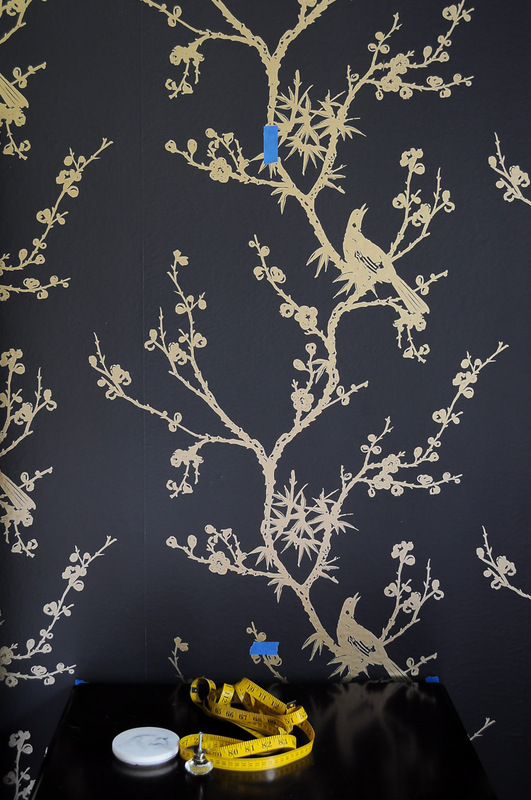 Also, make sure your walls are suitable for applying wallpaper (ie: not freshly painted or a flat finish). Step 1: We cut our first panel to the specs of the height of the wall, plus about 2″ on top and bottom. A laser level makes this process easier for everyone involved since most walls/crown/baseboards aren’t perfectly straight/level (in other words, don’t rely on those are your guide). We have a 6 month old house and we already notice slight shifts. and use the smoothing tool and work my way down the wall and removing the paper as I smoothed out a section. Smoothing Tip: The Tempaper smoothing tool (squeegee) is amazing and so great at removing air bubbles, BUT I would recommend smoothing with your hands first before you go nuts with the smoothing tool. This is so if you have to reposition the wallpaper for better placement, it’s not all adhered to the wall until you’re absolutely positive it is in the right spot. Step 3: Repeat steps 1 and 2 down the wall making sure your pattern placement lines up. trimmed down the panel I kept on hand to use on a DIY project later. 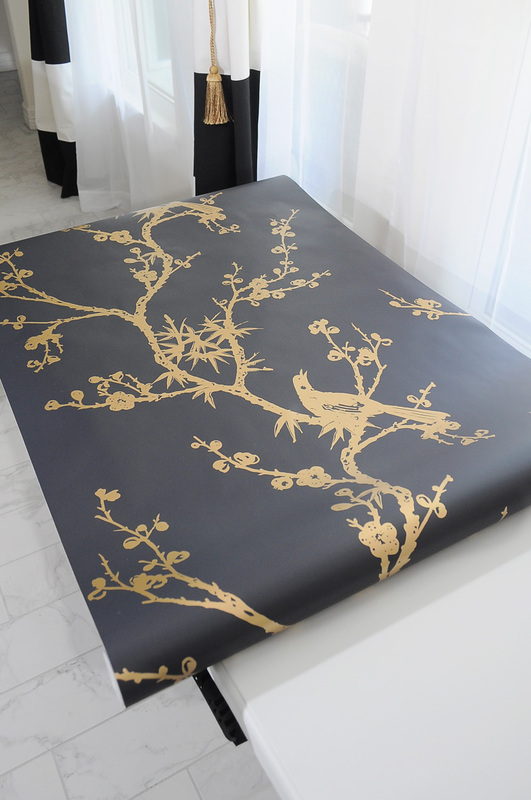 Mistakes & How to Recover: Tempaper is very forgiving, so if it’s not quite right, you can gently peel it off and try again. 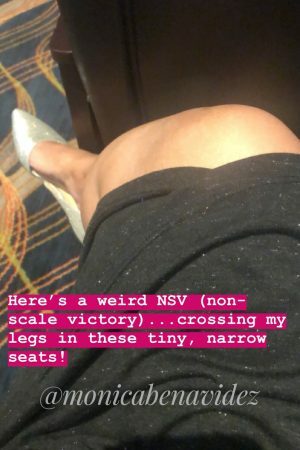 I will caution against trying to stretch it into place if it’s a “hair” off, and it’s vinyl so it will stretch, because once it shrinks back you may have a gap. If in doubt, remove and reposition, but do not stretch it out. Cutting Around Outlets: Cutting around outlets is a breeze to- CAREFULLY cut an “X” over the outlet area with a utility knife and cut away at the four triangle sections created. The most difficult part of it was the final piece which we essentially had to slice in half length wise (top to bottom). Given we live in a new home, we made sure our walls had very minimal texture, so the wallpaper lays beautifully on our walls. I’m still catching random air bubbles I missed and quickly smooth them out. 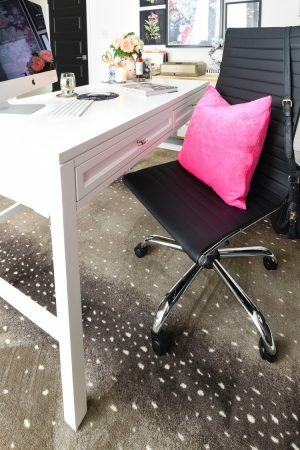 You can’t deny the amazing drama and personality it adds to the space, and I can’t recommend Tempaper enough if you’re in the market for some gorgeous, high quality, easy to work with removable wallpaper. It is perfect for renters and homeowners alike. This project took us about 6 hours including a pizza break and a tiny meltdown from yours truly when I thought I miscut a panel and lost my ever loving mind. True story. It all worked out. 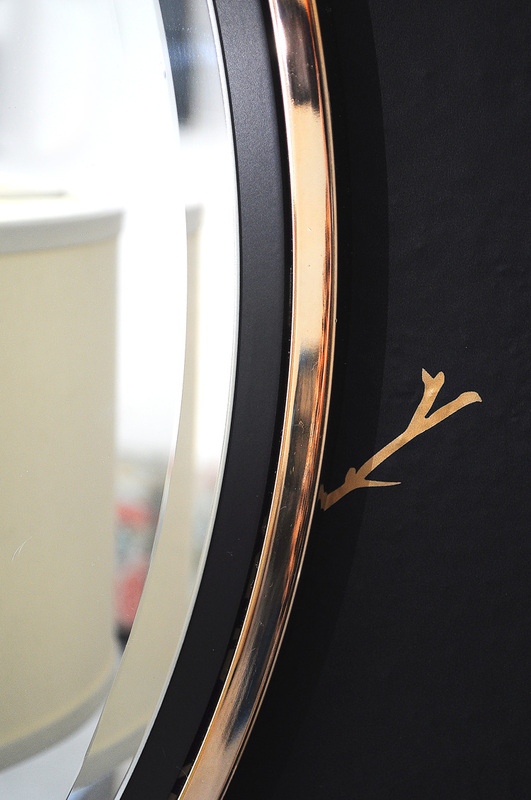 And then, we were on a roll, so we also hung up the gorgeous Wais mirrors provided by Holly & Martin! 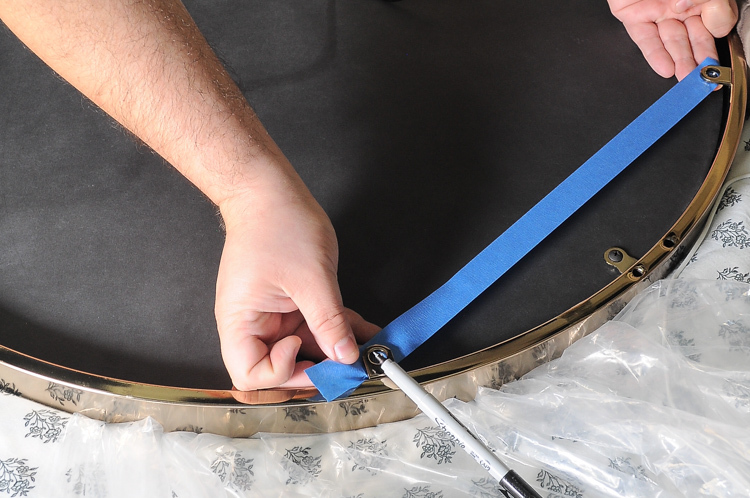 Here’s our process for getting these mirrors equidistant on the left and right sides of the bed AND level. Step 2: Then we decided on height, and since our headboard is really tall, we figured it should be around the height of the headboard. We then took a measurement with measuring tape to ensure the height was level on both sides (from floor to top of mirror AND from edge of headboard to center of mirror). We marked the height with blue tape and centered it with our nightstand tape. We tried to use a laser level for this and it was not working for this purpose, so this manual labor of love was most accurate and only took 15 minutes tops. Step 3: On the back of each mirror we placed a strip of painter’s tape under the holes and filled in where the holes were on the tape using a sharpie. We did this for each mirror in case the holes were slightly different. Step 4: Then, we put that piece of tape on the wall at the correct height and centered with our nightstand tape and used it as a template for our anchors and screws. Once the anchor was about 80% of the way in on both holes, I removed the tape so it wouldn’t get stuck under there. My husband placed the mirror on one screw at a time, and I spotted him should it not catch properly. We used anchors that can support 50 pounds because these mirrors are HEAVY. Since the mirrors are a circle, it’s impossible for them to be crooked. YASSS! We love how much light they reflect into the space due to the large windows we have. The quality, heft, finish and price point of the Wais mirrors is phenomenal. I wish we would have bought these for our master bathroom. 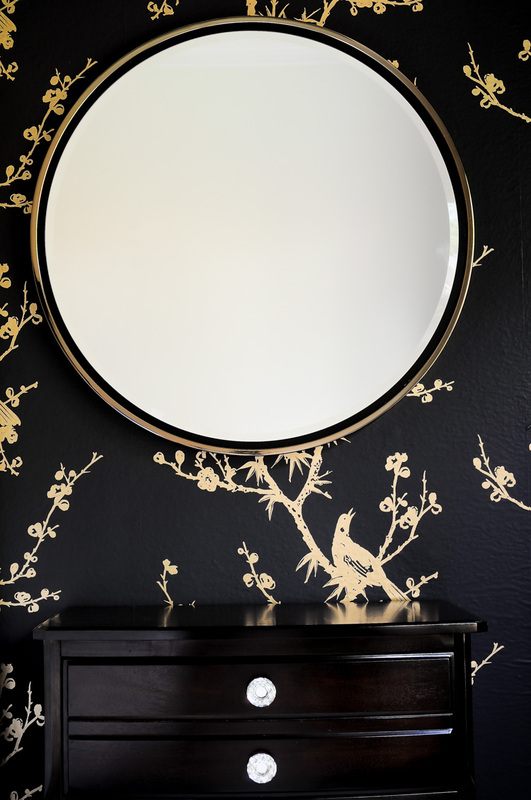 I love the gold finish and the black inset around the mirror. Unique and stunning. From here on out it’ll hopefully be smooth sailing, although I do have a few more DIY projects to accomplish: hanging new lucite rod and curtains, TV stand with O’verlays, TV gallery wall, getting the rug placed, and getting the bedding all squared away. 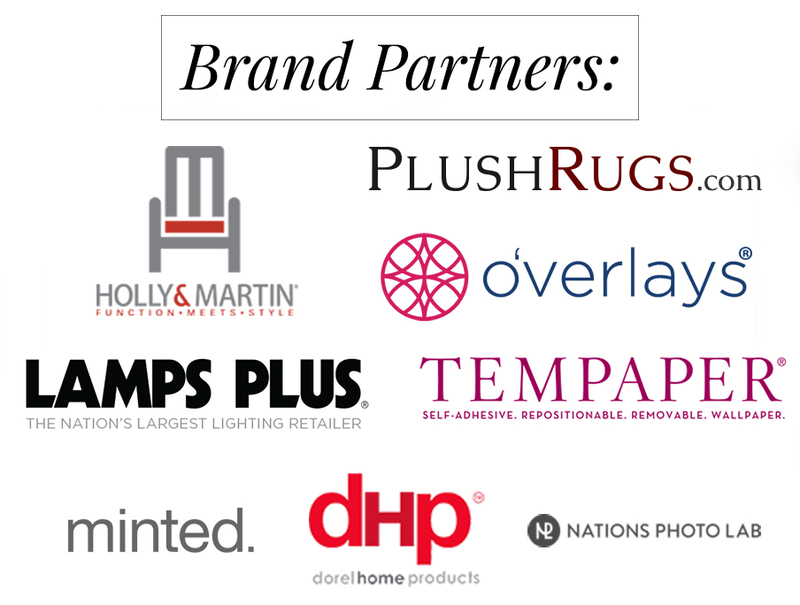 Next week my goal is to share with you sneak peeks at the new lamps, rug and curtains/curtain rod. 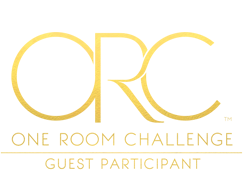 Visit this page to see all the ORC challenge updates for week 2. 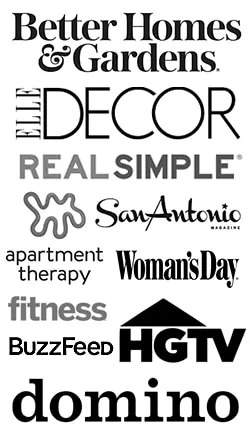 A big thanks to Linda at Calling It Home for creating and organizing the One Room Challenge with media partner House Beautiful! And a reminder I am headed out to High Point this Saturday! follow me on Instagram so you can checkout my stories! That wallpaper is incredible! Can't wait to see the whole room completed! The wallpaper is gorgeous! I've gotta try it. I love your tips on hanging mirrors and you are right, this space is going to be super chic! Looking so gorgeous already, Monica! 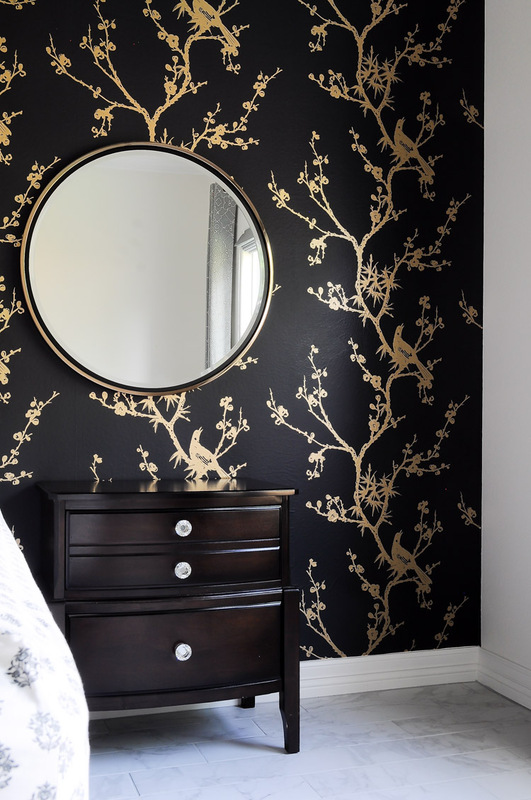 That mirror against that wallpaper looks fabulous! 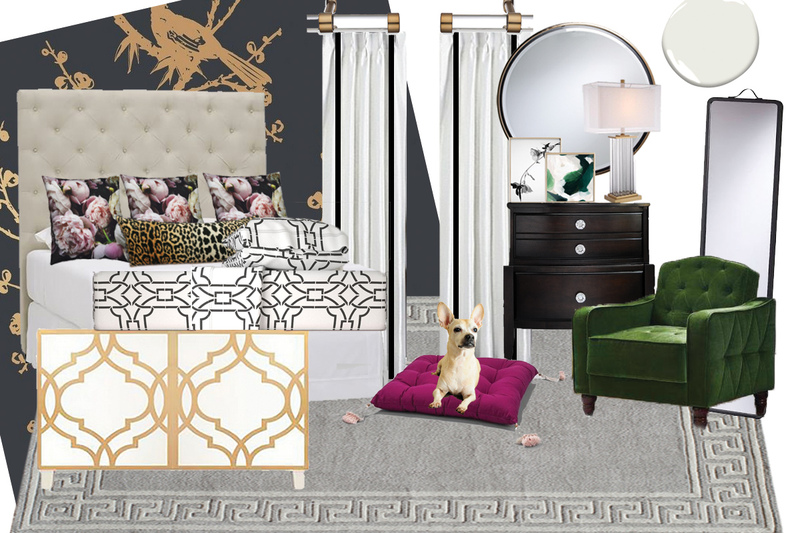 Can't wait to see this whole room together! This is beautiful wallpaper girl. And I love the mirror with it. 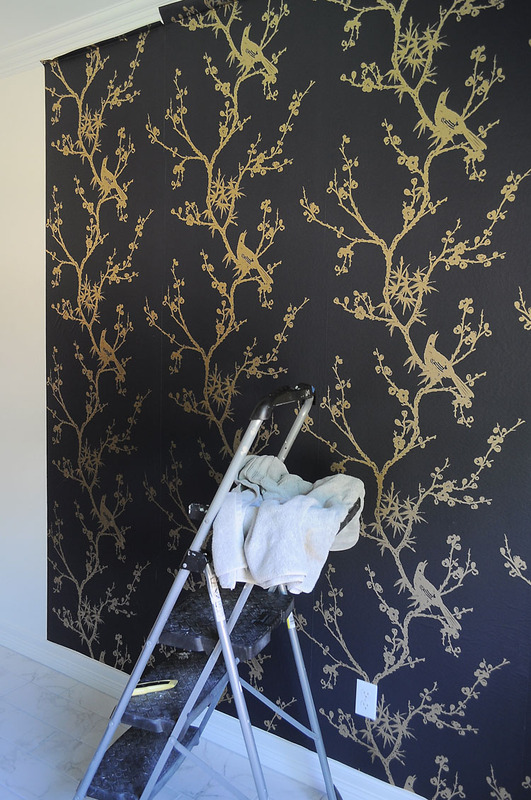 I'm terrified of wallpapering after watching my mom remove so many layers in houses when we were younger, but this seems like a good option! Monica!! Thank paper is stunning!!!!! It's almost like a room reveal all unto itself! 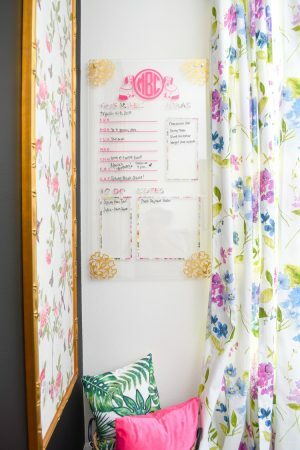 You could pretty much stop right there and your room would still look amazing! Love this dramatic wall! Love the wallpaper!! Thanks for the easy tutorial… I've always wondered how to install temporary paper. That wallpaper is amazing! I love how it looks with that ceiling! So pretty! 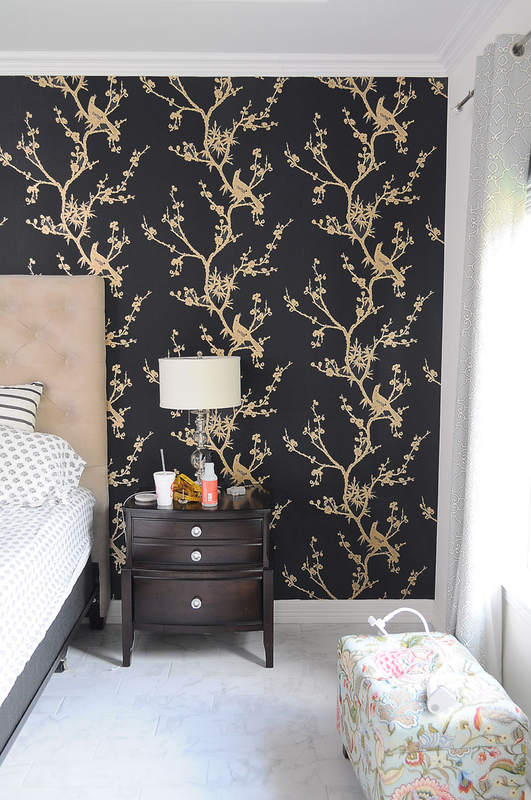 That wallpaper is amazing, very chic!! 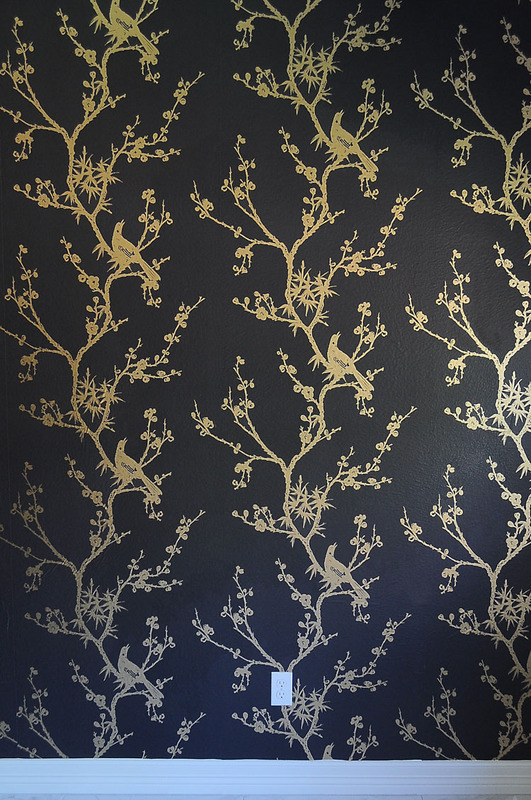 I will be hanging wallpaper soon, I hope mine turns out as great as yours. Ooooh aaaah! That looks fantastic! Oh wow, I love the wallpaper, it is amazing and those mirrors are amazing too. Can't wait to see more. Wow Monica!! The wallpaper looks amazing!!!!! Beautiful!! You might make me want wall paper! !